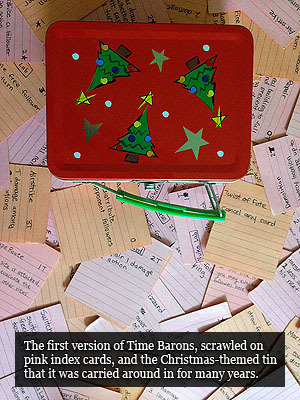 Time Barons was created by three old friends. Like many card games, it got its start many years ago on simple index cards, when it was first created by Jon and Aaron in 1999. Originally dubbed "The God Game", the basic mechanics have not changed very much since then - spend actions, manipulate your followers (represented by little tokens), and attack your opponents sites using a variety of devastating combos. 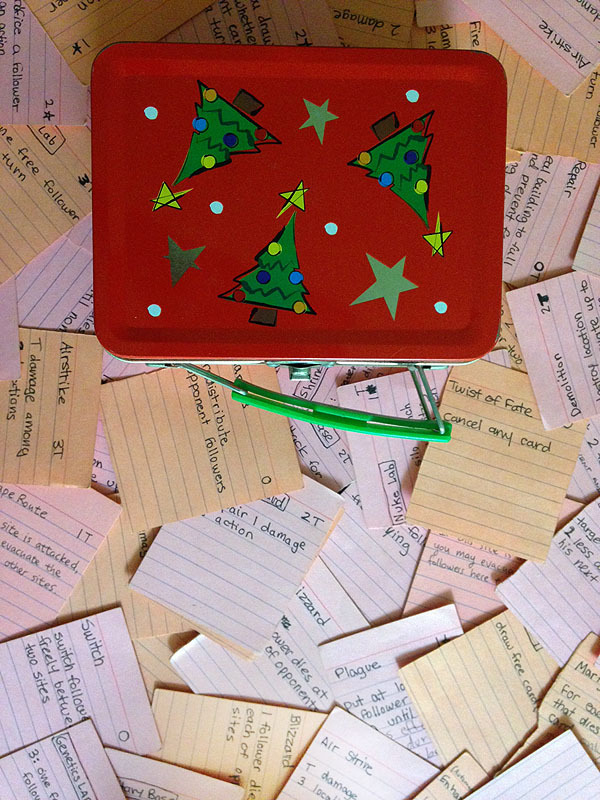 However, despite showing promise, the game languished for years, forgotten inside of a small Christmas tin. It wasn't until the late 2000's, on a camping trip of old high school friends, that Derek rediscovered the game and realized its potential. In fact, Derek liked the game so much that Jon and Derek decided to team up to develop the game further, retooling the cards, nailing down the rules, and adding the concept of advancing through the ages. The end result is a highly replayable card game that feels like a competitive video game in pacing but lets you draw cards and move tokens around across a table top. Thanks to the Game Crafter we were able to self publish the game in 2014 and start building a fan base. The game slowly gained a cult following, and in 2017, Time Barons was picked up by WizKids for worldwide publication.